Looking for something to boost your mood and health during these long, chilly winter days? The answer just might be exploring a new leisure activity. Leisure activities help reduce stress and can improve physical health at any age. For seniors, a variety of leisure activities can both improve health and help mitigate many age related concerns. Physical leisure activities reduce stress, improve the immune system, and help maintain flexibility and balance. Thought-provoking leisure activities such as card games, puzzles, seminars, and reading also reduce stress, and keep the mind and memory sharp. Better yet, leisure activities are an opportunity to socialize! A laugh with friends, whether it’s around the pool, listening to music, or in a book club, boosts mood and outlook. Best of all, enjoyable leisure activities offer a sense of purpose. Participating in a much loved activity brings a feeling of joy and accomplishment. That’s why we have such a full calendar here at FountainView. Meaning and enjoyment are different for each person, and everyone can benefit. In a senior living community with fitness facilities, games, clubs, and entertainment all under roof, it’s easy to explore a new activity and reap all of the benefits even when the weather doesn’t cooperate. Following are some of the great benefits of exploring a variety of leisure activities, plus ideas for specific activities that are perfect for seniors. Cardiovascular Health: Choose physical activities that gently elevate the heart rate, like walking, dance, and swimming. Our hydro bike is a great way to get you heart rate going and build strength with minimal impact on the joints. Balance and Flexibility: Physical activities that encourage muscular control and mental focus help with balance and flexibility. Water aerobics, yoga, and tai chi are ideal choices. Dexterity and Focus: Craft activities like painting, drawing, and knitting maintain and even improve dexterity and focus. Plus, learning a new skill helps keep seniors sharp. Memory and Concentration: Both physical and mental activities have been shown to improve memory and cognitive performance. Seniors who prefer quiet may enjoy crossword puzzles, Sudoku, reading, and stimulating lectures. For social seniors, card games and discussion groups are a great setting for socializing and exercising the mind. Social Engagement: Just engaging with other people can improve your mood, help fight depression, and lower stress. Whether it’s a chat over cocktails, or watching a funny movie with a friend, getting social helps get (and keep) you healthy. 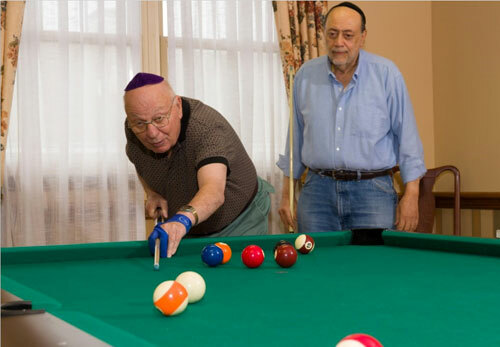 FountainView at College Road is a glatt kosher senior living community in Rockland County, NY. We offer a variety of engaging activities and fitness programs.